If you run into problems while using this website, please take a look below at our frequently asked questions. If you still need our assistance, please don’t hesitate to contact us. For information on visas, please check this page. For information on hotels, please check this page. For information on the programme, please check this page. Your MBUA (Member Body User Administrator) should be able to create one for you. Once your MBUA has entered your details in the GD, you will receive an email asking you to activate your account and define a password to complete that registration process. 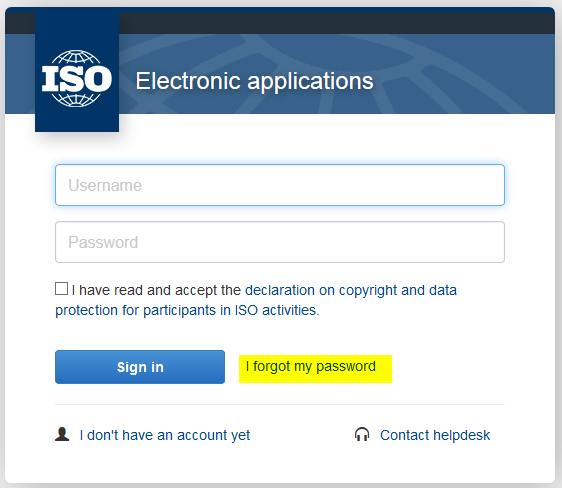 You must ensure you perform this step before you can register to the ISO Week in Germany. If you don’t have an MBUA, please click here for help. 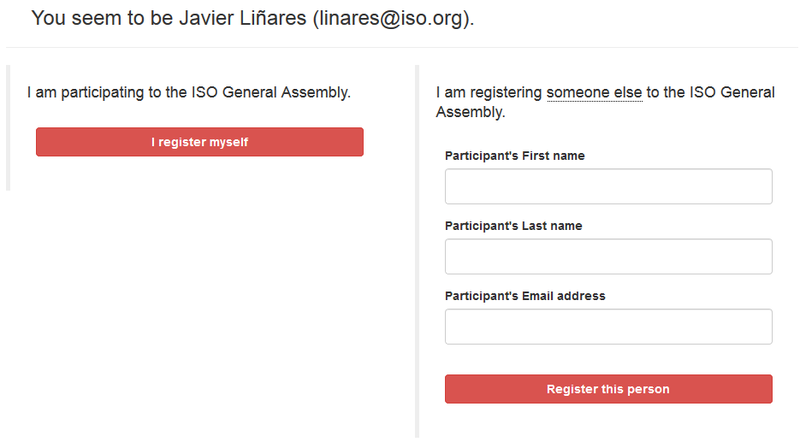 Only delegates from invited international organizations can participate in ISO General Assemblies. If your organization has been invited to participate in this year’s General Assembly, contact us so that we can create your account. Once we have entered your details in the GD, you will receive an email asking you to activate your account and define a password to complete the registration process. You must ensure you do this step before you can register to the ISO Week in Germany. 4. How do I register someone else? You have the option to register either yourself or someone else after logging in. In this latter case, you can login with your account and then register someone else to the event. 5. What is my registration code? Once you have registered, you will receive a registration code so that you can return to consult your personal information. In case you forgot your confirmation code you can have it sent to you automatically after specifying your email from this page. 6. I can no longer attend the ISO Week in Germany. How do I cancel my registration? We are sorry to hear that you cannot attend the ISO event and we appreciate you taking the time to cancel your participation. Please enter your email address and registration code on this page. On the next page under the My Registration menu, you will find a button Unregister. 7. What is a General Assembly official delegation? Member Bodies can nominate up to three delegates to participate in the General Assembly, one of which represents the head of the delegation. You can only register one head of delegation and two delegates but you can have an unlimited number of observers. Please note that we will contact you to change your registration if you do not comply with this requirement. Working documents are hosted in ISO eCommittees (ISO TC), you therefore need an ISO account and a role on the committee to access these documents. Please contact your MBUA so that they can create your account in the ISO Global Directory (GD). If you don’t have an MBUA, please click here for assistance. Working documents are hosted in ISO eCommittees (ISO TC), you therefore need an ISO account and a role on the committee to access these documents. Click here to send us an email so that we can create your account in the ISO Global Directory (GD). Working documents are hosted in ISO eCommittees (ISO TC), you therefore need an ISO account and a role on the committee to access these documents. Please see numbers 1 and 2 above. If you have forgotten your password, please refer to number 3. Once you have this information, you will be able to access the documents from the ISO Week in Germany website or the mobile application. Access to these documents is only authorized for Council and TMB members. CEOs of ISO members have also access to these working documents, for information. If you are a Council or TMB member and cannot access the working documents, please contact us.